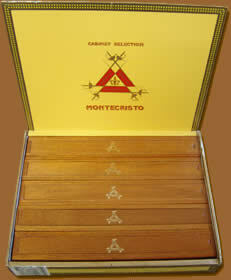 We offer authentic cuban A Box Of 5 Coffins cigars. One of the giant vitolas. Reserved for some festivities. In general, they all agree that Monte "A" is something special. However, many old connoisseurs are a little bit disappointed with the herbal flat taste of the first third. At the beginning of the second third, we enjoy some cedar notes and hints of spiciness. Suddenly, the smoke becomes dry and hot. The draw becomes more difficult and the final is aggressive. Now in Coffins of 5 cigars. Very elegent and ideal for a gift usage.